You are currently browsing the archives for the Dungeons & Dragons category. Westhorn, a dwarven fighter. A blacksmith’s son, he was press-ganged into a local human warlord’s service, there falling in with the similarly unwilling Puegom to plan and execute an escape. From their the pair journeyed to a city to seek their fortunes, and met up with the others of their current group. Volrak, a human paladin. A child of the barbaric mountain tribes, he left in distaste at their petty feuding and worked as a sword-for-hire before finding his calling in the paladin order. He seeks the Avinex Regales, a powerful icon of Good, lost centuries ago somewhere in the current region. Leaf, a half-elven ranger. Found abandoned by his parents, presumably because of his half-blood heritage, Leaf was raised by the elves. He seeks his parents, and has developed a strong sense of responsibility for children in need of help. Henri leMarche, a dwarven thief. A bombastic dwarf with a penchant for regaling all within hearing range with Munchhausen-esque stories of his past exploits as a Titan, a cursed frog familiar of the famous bog-witch who ascended to godhood, and various other. Puegom, a gnomish magic-user. Fled from his home village after an embarrassing situation which won’t be dwelt on, he book-learned a few minor spells before being captured by the same warlord as Westhorn. After their escape he apprenticed to a wizard in the city, before departing to join the adventuring party with Westhorn. Olaf Northling, a human cleric of Njordr, god of the sea. A skilled fisherman, he turned to the spiritual life after becoming fascinated by his village priest’s stories of Njordr. He left his home with youthful wanderlust and fell in with the present band, but is starting to feel his age and yearns to return home and settle down. The adventure began in a tavern in a small town they were passing through, with the delivery of a mysterious letter by a gypsy. Answering the call for help in the letter, they journeyed along the Svalich Road to the bleak town of Barovia, which is surrounded by an unearthly fog. They spent a couple of days getting their bearings in the town and meeting various people, including Ismark and Ireena, the son and adopted daughter respectively of the Burgomaster, dead some two weeks. Everyone else in the village was too scared to help Ismark bury his father, so our heroes assisted with a burial of the decaying body. They also paid a visit to Mary, a distraught woman pining for her teenage daughter, who went missing a week ago. They assisted the priest of the shattered church to reinforce and strengthen the church building – help needed because, as they discovered on their first night, wolves habitually entered the village at night and attempted to gain entry into any building not suitably fortified. Ismark and Ireena spoke of other horrors – missing villagers returning as walking corpses to terrorise the living. Ireena was also suffering a wound, an unnatural bleeding from her neck, visited upon her during a night some days ago, despite her sleeping in a barred room with boarded up window. She spoke in hushed tones of the “Devil” looming over the village, a Devil known by the name of “vampyr”. The heroes determined that the probable cause of all this misery lay hidden in the dark castle looming over the village from the thousand-foot high cliffs to the north-west. They set out early the next morning, with Ireena, who was determined to accompany them and proudly showed off her sword skills. Taking the road, they reached a fork, and chose the path leading to a gypsy camp by the river. Here they encountered the cackling mad Madam Eva in her colourful tent, who seemed to know more about the heroes than she should have. She read their fortune with the cards, telling of both great evil in the castle, and also icons of hope that may help to defeat the “Devil”. Continuing to the castle, the heroes entered the courtyard across a decrepit drawbridge, and then into the keep building within, which looked bright and inviting. They made it through three rooms of the entry halls and into a dining room where they caught sight of their adversary, playing a pipe organ. He invited them to dine and drink, but then vanished – an illusion! The candles blew out and the doors all slammed shut! Racing back out to check their escape route, they were ambushed by the 4 small dragon statues in the entry hall, turned to real dragons! After a hard fought battle they defeated the tiny dragons, but sustained some considerable wounds. They are now considering their position… to be continued next session. Some game mechanical notes: Firstly, the card reading sequence is presented in the module with normal playing cards, but I did a mapping to Tarot cards and ran it with the players actually shuffling and dealing out Tarot cards. It made it a lot more atmospheric, especially with the cackling Madam Eva interpreting the omens on the cards. Secondly, even baby dragons are a nasty, nasty challenge, especially for the opening combat of an adventure! Despite having only a small number of hit points, they have an insanely good armour class, make attack rolls as 9 hit dice monsters, and do an enormous amount of damage. So they were very hard to hit, while hitting back effectively for devastating damage. I begin to wonder if setting the character levels at the very top end of the suggested range for the adventure will be enough! The next session is yet to be scheduled – it will probably be at least a few weeks away. Given how tricky it is to get us all together on the same day, I’m cautiously hoping to complete the adventure by Christmas. Leaf (or maybe it was Leif), a half-elven ranger. Henri leMarche, a dwarven thief. (to be named), a human cleric. 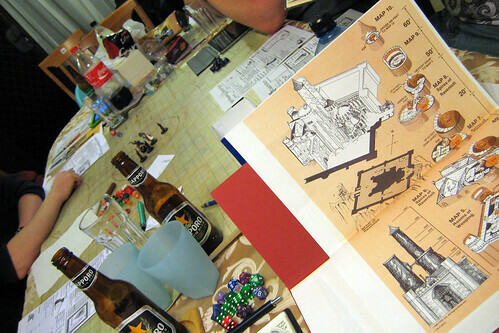 Although we’re playing 1st Edition AD&D, I’m basically ignoring the racial class limitations (thus Puegom). I’m currently in the process of working out what magic items they all own, the assumption being they are a seasoned band of adventurers who have already shared some exploits together. I’m really looking forward to this. 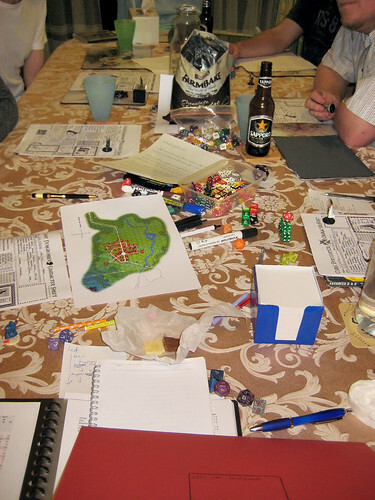 I haven’t run D&D for… well, since 1st Edition was the current edition! I’ve been wanting to run some more roleplaying for some time, and finally managed to herd the group of cats that are my work friends into the same evening. It’s a few weeks away still, but now I can really start planning. 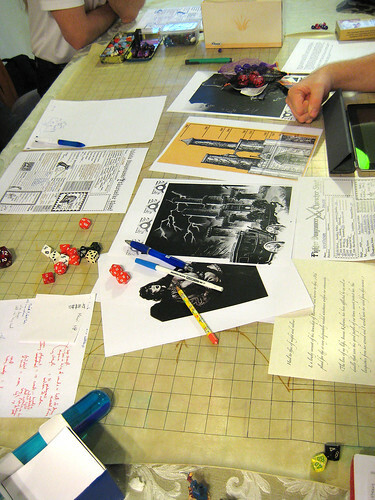 The game will be Dungeons & Dragons, 1st edition, and the adventure will be the original classic I6: Ravenloft. Oh yes. It will be fun.